There is a common perception that ‘gaining weight is easier than losing weight,’ and to some extent it's true. For example, you can gain weight through inactivity, by eating junk food and doing nothing! But here’s the catch, that weight gain would be in the form of fat around your belly, arms and other unwanted places - not what you want. 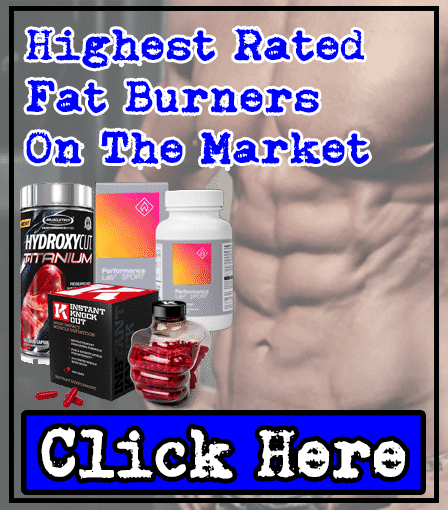 For hard gainers, packing muscle mass to their skinny frame can seem like an impossible task at first; this can be due to several reasons, with one of them being their naturally fast metabolic (high metabolic rate). For argument sake, let’s just take fast metabolism out of the context. There are other factors too that can be taken into consideration for hard-gainers such as genetics, not burning enough calories etc. 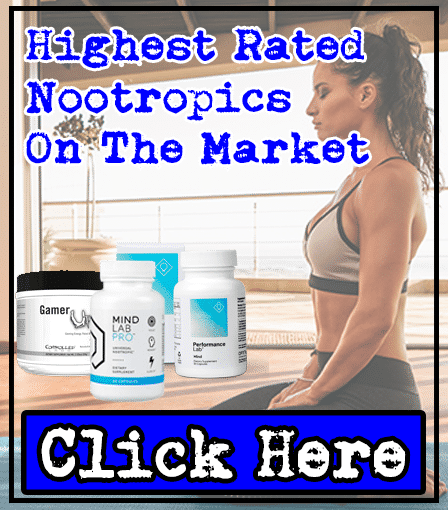 All in all, it is fair to say gaining weight is not that easy, but it can be by simply following some major tips from experts in the field. 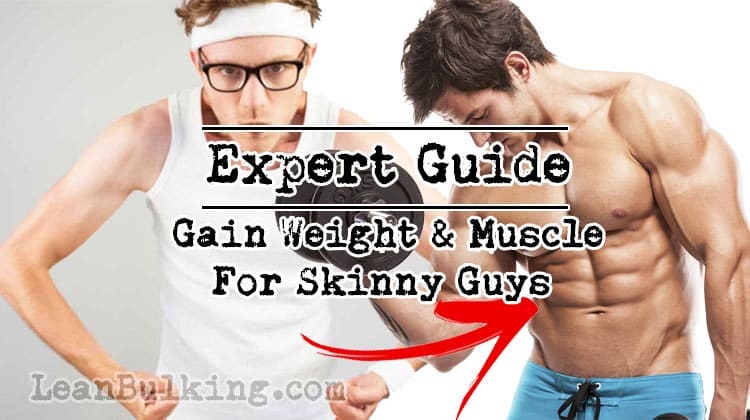 So here are some effective and highly applicable tips for skinny guys to gain weight & muscle. It might be irritating to hear & read so many times, but it's important to ‘consume more calories than your body burns'. This is what experts have been trying to tell you for so long, and for good reason. What can you do? Well, start with a 500 kcal per day surplus; this plan is the best for beginners and it is mostly recommended to skinny guys. You need to increase the number of calories with the passage of time (potentially up to 1000 calories surplus, depending on your progress) and make sure that you are keeping a track of your weekly progress. Ultimately, if you don't keep a close eye on your progress, you won't find the 'sweet spot' in terms of calorie intake, where you'll add lean mass without increasing your body fat too much. When we say starchy carbs, we mean rice, potatoes, oats etc. You need to consume high-calorie food (not junk food, but healthy carbs) in order to bump up your calorie intake. Why? Remember that you need to eat a calorie surplus (over your basal rate metabolism). As starchy carbs are generally more calorie dense, it'll help push you over the finish line to finally gain weight and muscle. Don't forget about protein; an increase in protein intake will help you gain weight & muscle. 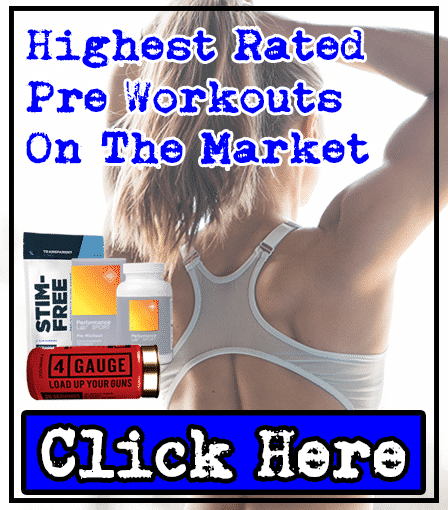 Formula's and crunching numbers might seem scary for those who don't really like to calculate their macros, but it is the key to success on your fitness journey. Why? Because you need to understand that your muscles have to recover after every workout, and protein helps your muscles to recover and grow. As a result, make sure that your protein intake is around 1.3-1.5g protein per kg bodyweight. This means increased consumption of protein-rich foods such as fish, chicken, other meats (or high protein vegetarian sources such as tofu, seitan, mycoprotein etc). However, you don't need protein shakes. It's actually more beneficial to consume your daily protein requirements naturally, and your body will respond better. Don't get us wrong, when you're really in a hurry and don't have the time, then get a protein shake down your neck. But when you can, always cook up a meal including a high protein source, complex carbohydrate and green vegetables. 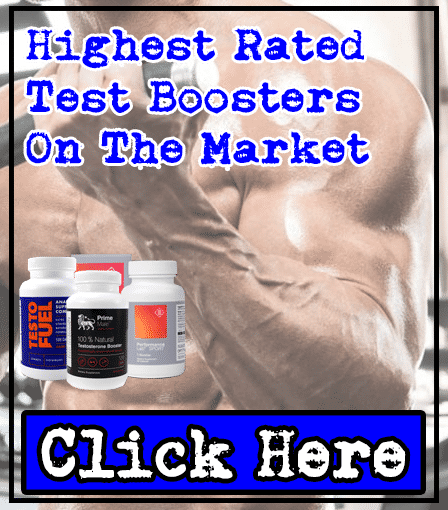 If you're looking for supplements to help you gain muscle, then we recommend considering natural test boosters instead of protein shakes. Eating smaller, more frequent meals is a common tactic used by those wanting to boost their metabolism and burn fat. 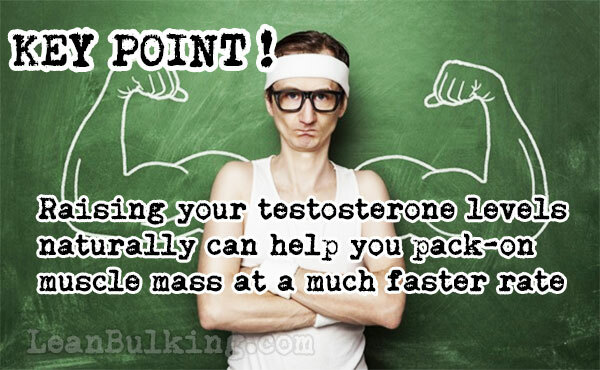 However, it can be equally as effective for skinny guys wanting to pack on weight and muscle, using calorie dense meals. Basically, to gain weight, you'll have to eat more meals in a day without making yourself feel sick. So, instead of 3 heavy meals a day, try to eat 5-6 smaller meals that are loaded with calories, complex carbs, healthy fats, and proteins. But obviously make sure to pack your meals with calorie dense and high protein foods in order to boost your calorie intake and chances of gaining muscle mass. With about a 500 calorie surplus per day, you can gain around 1 pound in a week. It can be difficult at first, but trust us, soon your body will start responding to it. We're going to repeat this because it's so important; if you're a skinny person, then it is imperative for you to keep a track of your calories intake. We've heard so many guys complaining about eating too much without making any progress. But this is simply because they are not keeping a track of their calories intake; without knowing exactly how much you're consuming, you can't know for sure whether you're reaching a calorie surplus. Just make sure that you start tracking the calories for every single meal you consume (as well as protein, carbs and fat intake too). Ultimately, you can only know whether you're achieving your macros and calorie goal by simply noting everything down – make essential adjustments at the end of each week to adapt and succeed on your fitness goals. If you are working out well and eating the right healthy foods, then there is no force in the world that would stop you from gaining weight and muscles - even Chuck Norris will approve, that's a fact. You need to make sure that when you're not training, you consume slow digesting carbs or whole grains. On the other hand, you need to consume fast digesting carbs during pre-workout and post-workout; these fast-digesting carbs can be maltodextrin, dextrose, waxy maize, etc. Just make sure that you are also consuming ample amounts of proteins and supplements. Personally, we use pre-workout supplements and testosterone boosters to give us that 'kick' to pack on those gains, fast. You've probably heard that eating in the afternoon is bad when trying to lose weight. Well, when you're trying to add some bulk to your skinny frame, it can be a good idea to increase your carb consumption during the afternoon. Of course, you'll figure out what's right for your own body by trying different things. If you react well to eating carbs in the afternoon, then continue doing it. If not, then load up earlier on in the day. But we'll finish our nutrition advise by reminding you; a calorie surplus of at least 500kcal per day is necessary to gain weight and muscle to that skinny frame! Don't Train Harder, Train Smarter! 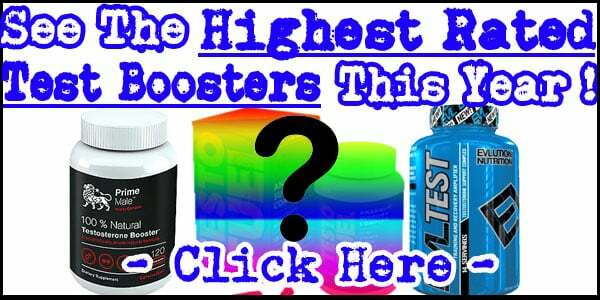 This is a simple solution for those who desperately want to gain weight and muscle. It's commonly known that overtraining can have an adverse impact on the body. That's right, sometimes putting too much effort into bulking-up can have the opposite effect - and it's where many skinny beginners go wrong. Therefore, make sure that you are training in the right manner. Not just training extra hard to gain weight and muscle at a faster rate. As the old saying goes, 'Rome wasn't built in a day' and neither was Ronnie Coleman or Arnold Schwarzenegger's physiques. Ultimately, patience and a smart training plan is something that will help you realize your fitness goals. This goes with the advise that we gave you above - don't over-train your body and take time off when you need to. Why? Because gaining weight and muscle is not only linked to eating good food training correctly, but you need to give your body some time to recover and breathe. Remember that your muscles don't grow in the gym, you make gains while you rest. Sleep is crucial because it enhances the release of growth hormones in your body and increases the process of muscle growth as well. As we've already mentioned, if you want your body to grow big, then give it some time to recover. Also, by getting the recommended amount of sleep, you'll feel fresher and more able to put more effort into each workout - and get faster results. If you want to gain weight then it is best to avoid doing cardio. Some might suggest you that you need to do cardio and powerlifting, but it is always best to stick with lifting. Why? Because cardio burns calories, which isn't great when you're already struggling to increase your calorie intake by eating bigger meals. 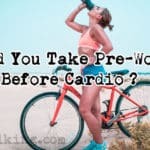 However, if you really enjoy cardio and you find it beneficial, then just try to minimize it. Just make sure that your cardio is not intense and try to keep it short. An example can be given of IFBB pro bodybuilder and nutritionist, Shelby Starnes. He has never prescribed his clients to do cardio while they are attempting to gain weight, and they still became beasts! Just make sure that you're performing weight training in your weight gaining cycle. It's simple, this is what competitive powerlifters and bodybuilders do and they're stacked - so go along with what's tried-and-tested! First of all, be as motivated as you can! Motivation becomes the main driving force behind your journey to gain weight and muscle - especially if you're a hard gainer. Your motivation level needs to be high and the best way to do this is to regularly check your improvement. Checking your weight each week can be very important. As your body slowly begins to change, you might not even notice yourself - so take pictures so you know for sure your plan is working. Everyone likes sharing progress pictures. It's something to be proud of, and this will help keep your motivation high. Also, weigh yourself in the morning (preferably after coming back from the toilet). This way you’ll have a better idea of how much weight you've gained. Not only that, be consistent! By eating a lot for 5 days and not eating enough during the weekend, you might ruin your efforts. You have to be consistent with your routine and soon the results will start to appear. Keep your calorie and protein intake high, and you will see bulk added to your skinny body. Eating real food (foods that are rich in nutrients & minerals) is essential, but you also have to concentrate on exercises that help in building muscle mass. Here are some exercises that can assist you in gaining weight and muscles; Squats, Bench Press, Overhead Press, Deadlifts, Dips, Chin Ups and Pull-ups. These exercises should be the foundation of your workout plans. Plan around these exercises and think about any isolation exercises as the 'cherry on your cake'. By doing this, you'll be providing your whole body with the stimulus it needs to make gains! In conclusion, you'll gain weight and muscles by consuming high-calorie meals, training smart and giving yourself enough rest (preventing over-training). Also try to avoid eating junk food because it won’t help you in the long run, and you'll end up with a higher level of body fat than you want. However, if you really are a 'hard gainer', then adding some extra cheat meals to your diet can help give you that 'push' you need. But by cheat meals, we mean a huge bowl of spaghetti bolognese, not fried chicken, fries or other highly-processed, deep fried foods! You can have as many cheat meals as you like...as long as you cook it yourself! One rule can be to try and cook everything yourself. If you're prepared to make your own fries in the oven, then you load up on fries! Why? Because only food that are rich in nutrients will help you in the long run, and deep fried foods don't really give you many beneficial nutrients. If you're cutting up fresh potatoes and cooking them in the oven, then they'll be significantly better for you and even help you achieve your fitness goals. Another important recommendation for you is this; cardio is your enemy if you want to gain weight and muscles, as it can lead to you burning too many calories - leading you to eat less calories than you need. Ultimately, if you love to run then try to reduce it or try running in short sprints. But let's be honest, we won't have to convince many people to stop performing cardio! Bottom Line: It can be said that the factors which play a pivotal role in gaining weight and muscle are; your diet, lifting, schedule, commitment and enthusiasm. 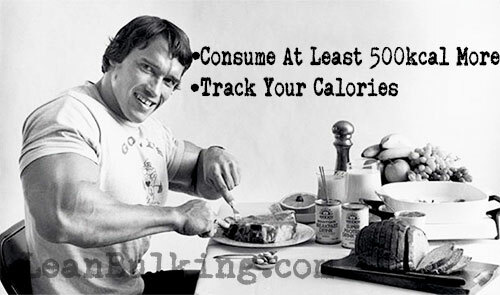 Start calculating your calorie intake and train smart - you’ll gain weight and muscle, guaranteed!